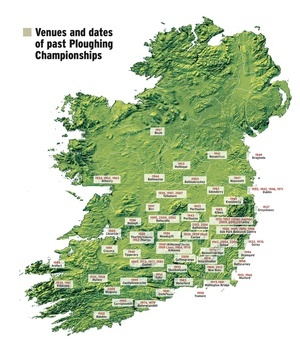 A map by the irish Farmers Journal detailing the venues for the National Ploughing Championship since its inception in Athy in 1933. This year’s championship takes place in Stradbally, Laois and begins tomorrow. Posted in Misc and tagged National Ploughing Championship at 11:29 am on September 22, 2014 by Aaron McAllorum. I see Mogeely has moved towords Mallow…. Jeepers. What happened in Boyle all those years ago. With all the prime tillage land around Meath and Louth seems nuts that it hasnt been north of the Dublin-Galway line in over 10 years.